There are no fitness classes Good Friday, April 19 and Saturday, April 20. The Y will be closed Easter Sunday. T-ball and coach pitch baseball practices have been cancelled for Friday, April 19 due to forecast for severe t-storms this afternoon. Get ready by signing up for our SUMMER READY CHALLENGE. Earn points by working out, taking a fitness class, signing up for a program, etc. Convert those points to Y BUCKS and use those Y BUCKS to purchase merchandise or pay for Y Programs! When you sign up for our Summer Ready Challenge, you will receive (3) guest passes to share with friends. 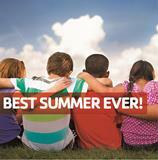 If your friend joins the Y, you get 10 points and your friend receives 1/2 off the joining fee! Sign up at the Wellness Desk or for more information see Mike Wightman. Join us for FREE FUN FOR ALL AGES- Saturday April 27th from 9 am until 12 noon, we'll have an inflatable obstacle course, free healthy food choices, family field games, a jump house, giveaways and much more! A short family fun run will be held at 9:30 am and family games throughout the morning. Healthy Kids Day is a nationwide initiative to improve the health and well being of kids and families. We look forward to seeing you here! H2O Camp starts July 15! A water experience camp for good swimmers who are interested in increasing their aquatic sports knowledge! Participants will learn and experience a new water sport or skill each day, such as SCUBA and snorkeling, water polo, Jr. lifeguard skills, kayaking, safe boating and springboard diving. Read more: H2O Camp starts July 15! Lifeguards are needed here at the Y! Not Certified? Classes start in May. Participants must be at least 16 years old and have excellent swimming skills. The class includes all books and YMCA of the USA National Certification for YMCA Lifeguard as well as American Heart and Safety Institute CPR Pro including AED, Oxygen Administration and First Aid required for certification.